Would you like to become a retailer? Contact us! Every baby needs & loves to be held! 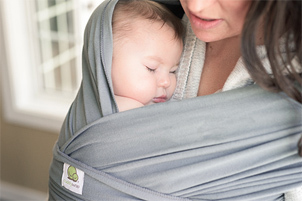 Babies carried in the CuddlyWrap feel more secure because they are close to your heartbeat, voice, scent and warmth which promote optimal development. The baby is positioned at the appropriate height for eye contact and visual stimulation with your face. For a newborn, the CuddlyWrap promotes vestibular development (inner ear and balance) by providing boundaries and movements that mimic the environment of the womb.